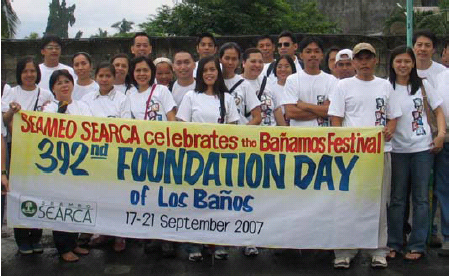 SEAMEO SEARCA continues to be an active member of the Los Banos Science Community (LBSC) Foundation. Established in 1984, the LBSC Foundation is composed of academic and development organizations in Los Banos and its environs. Its vision is to build a prosperous, environmentally-conscious, scientifically-oriented, humane, and united community, living in harmony with nature. 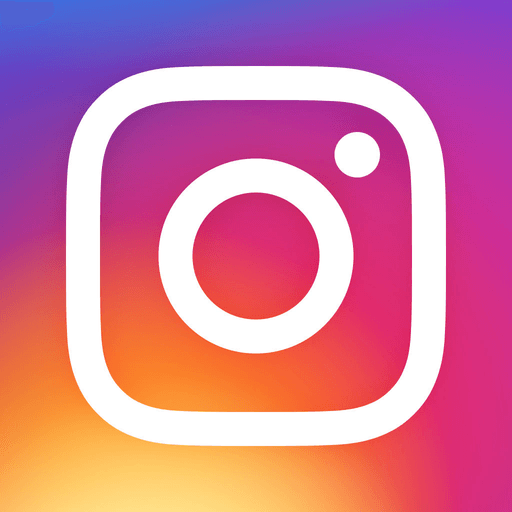 LBSC currently has 22 members. Since October 2003, SEAMEO SEARCA has been serving as LBSC Treasurer. As Treasurer, the Centre takes care of the Foundation's financial transactions including its investments, ensuring that the best interest rates are obtained. Every year, LBSC conducts a National Science and Technology Week (NSTW). For FY 2007/2008, SEAMEO SEARCA, through its Biotechnology Information Centre (BIC), set up an exhibit during the NSTW and sponsored several fun and interactive educational games dubbed "Knowledge Quest on Biotechnology," conducted at Baker Hall, University of the Philippines Los Banos. It was participated in by high school and college students from Laguna and nearby towns. NSTW was held on 17-20 July 2007 with the theme "Science, Technology and Innovation for Progress: Focus on Biotechnology and Environment." 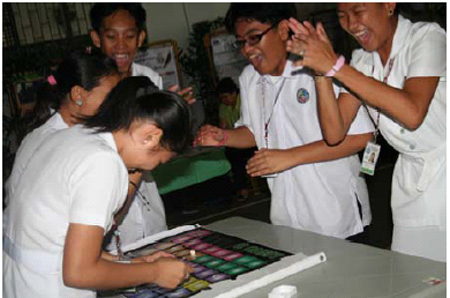 High School Students from Various Schools in Southern Luzon Region of the Philippines Enjoy an Interactive Biotechnology Game Prepared by SEARCA's Biotechnology Information Center. SEAMEO SEARCA also took part in a public awareness forum held during NSTW. It can be recalled that a strong typhoon hit Los Banos in 2006, wherein damage to life and property was extensive. The forum covered environment, safety and management concerns of Mt. Makiling where the villagers are primary stakeholders. Aside from the above activities, SEAMEO SEARCA also donated computers, computer servers, and used vehicles to the University of the Philippines Los Banos, a computer set to the Los Banos-Calamba Transport Federation, coaster de luxe to the Municality of Los Banos, and books, office supplies, and furniture to the Landcare Foundation of the Philippines, Inc., Claveria, Misamis Oriental. SEAMEO SEARCA, a Member of the Los Banos Science Community (LBSC), Joins Los Banos in Celebrating the Town's Founding Day. 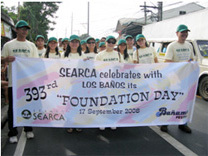 As a member of LBSC, SEARCA participated in the annual National Science and Technology Week held on 14-18 July 2008, the highlight of which was SyenSaya: A Los Banos Science Festival. Syensaya's main goal was to promote the philosophy that 'science is fun' SEARCA was directly involved in organizing the Research and Development Symposium at SyenSaya. SEARCA has also served as LBSC's Treasurer since 2003. 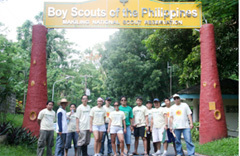 SEARCA also joined the Boy Scouts of the Philippines in a tree-planting event on 18 July 2008 at the boundary of Mt. Makiling Forest Reserve. The forests on Mt. Makiling collectively perform various important ecological functions, including the prevention of soil erosion and as sanctuary for wildlife. Mt. Makiling is an important watershed and a source of the natural springs that are among Los Banos' major tourist attractions. The Center also extended support to the local municipality of Los Banos by taking part in its 392nd Founding Anniversary. Dubbed as Banamos Festival, the festivities include a parade, community contests, as well as exhibits. 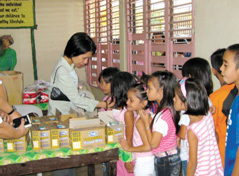 SEARCA conducted a gift-giving for its adopted school -- Maahas Elementary School, a public school located in one of the villages of Los Banos on 17 December 2008. The school's pupils were given milk and other gifts. During the fiscal year in review, SEARCA made the following donations: (1) used vehicles to the University of the Philippines Los Banos and the Municipality of Los Banos, and (2) various fixtures and carpentry materials to the Makiling Tennis Club, Inc.